Today I found out about the use of exploding anti-tank dogs during World War II. These dogs, usually Alsatians, were also called "Hundminen" or "dog mines." They were trained to carry explosives on their bodies to enemy tanks, where they would then be detonated. No, it did not end very well for the dogs in question. This type of animal weaponry was first used by the Soviets. Following a decision in 1924 to allow dogs to aid the military, a dog training school was set up in Moscow. The military recruited such people as police dog trainers, hunters, circus trainers, and animal scientists. Twelve more schools were set up hot on the heels of the first one and the Soviet dog-training division started out in earnest. At first, dogs were trained to carry supplies, tracking mines, and rescuing people -tasks at which the dogs excelled. In the early 1930s, they decided it would be a good idea to turn man's best friend into an anti-tank weapon. Three of the schools began training dogs for this purpose. First, they were trained to carry a bomb to a tank and run off; afterwards, their handler could detonate the bomb with a remote or the bomb may have simply been set with a timer. There were several reasons that these methods didn't work. To drop the bomb, the dogs had to pull on a belt with his teeth to release it. This proved to be too complicated, and often the dog would simply return to its handler without releasing the bomb. Secondly, remotes were too expensive at the time to be used practically, so timers would be used more often instead. If the dog returned to his handler with the bomb still attached, he would have killed the handler and himself. Even if the bomb was released under the tank, if the tank was in motion and the timing wasn't set just so, the bomb would simply explode without doing any damage to the enemy tank. The Soviets scrapped their initial plan, but unfortunately for Fido, they came up with a new one. Rather than drop a bomb, explosives would be strapped to the dog. When the dog went under the tank, the bomb would be triggered, killing the dog (and, hopefully, disabling the tank). As if ending their life wasn't enough, the training involved wasn't exactly a walk in the park. The dogs were starved, and then food was placed under a practice tank, training them to think that food was under all tanks. After a while, additional battle sounds were added to their practice runs so that they wouldn't be spooked when they were running under the real thing. Anti-tank dogs started being used in earnest in 1941, when German forces advanced on Soviet lands. Thirty dogs kicked off what would be a rather lacklustre debut for the exploding dog-force; indeed, the dogs were so ineffective that the Soviet military was accused of simply sacrificing them. Part of the problem was that many of the dogs refused to dive under the tanks in the field. They were being shot at, which hadn't happened in training, and they were understandably not willing to dive under some huge "beast" that was seemingly trying to kill them. Food can only motivate an animal so much. I could put a steak on my vacuum cleaner and my dog wouldn't go near it, even if she was starving. A tank with guns a-blazing is a tad more noisy and frightening. When the dogs were shot and killed before they could get into position and blow up, they were taken by German soldiers who were able to examine the weaponry and potentially copy it themselves. They didn't end up taking advantage; rather, one captured German soldier claimed that they found the entire system rather inefficient. Well, it was. One downside of this was that the Germans did take measures to defend themselves against the dogs, rendering their sacrifice often useless. A much larger problem was that the dogs had been trained with Soviet tanks, not German ones. 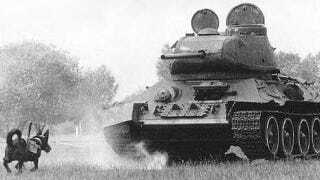 Soviet and German tanks used different types of fuel, and some of the dogs sniffed out the fuel they were used to and trotted off to blow up the tanks used by the very military that trained them. Oops. That said, the anti-tank dogs are known to have taken out some tanks, including at the Battle of Kursk in which twelve tanks were destroyed by sixteen deployed dogs. This was possibly one of the most successful anti-tank dog ventures in history. The Soviets later reported that some 300 tanks total had been destroyed by anti-tank dogs, but many question this number, thinking it was probably made up by the Soviet government who wanted to justify the program, particularly justify killing so many dogs with so few results. Whether they were useful or not, anti-tank dogs started to be used less and less from 1942 onwards, though there were anti-tank dogs that continued to be trained until 1996. While the Soviets were perhaps the most prominent users of anti-tank dogs, they were trained in other countries, too, including Japan and the United States. Much more recently, bombs were strapped to dogs as late as 2007 when insurgents attempted to use them during the Iraq War. In this case, there's only one documented case of a bomb actually being detonated while attached to a dog though; protests rose up among Muslims who believe that animals should be killed only for food. Dogs were not the only weaponized animals. There were attempts to make bomb carriers out of cats, birds, and rats. Bombs have also been strapped to camels, horses, donkeys, and mules. Donkeys were especially favoured in Iraq because they could carry packs stuffed with bombs without looking suspicious. Even monkeys and, supposedly, whales could not escape the military's explosive reach. Dolphins trained to kill by the Soviet Union were sold to Iran in the 1990s when the Russian military closed its marine mammal program. The United States Navy still has such a program, though dolphins are supposedly not trained to kill, but rather to perform various other tasks. Emily Upton writes for the wildly popular interesting fact website TodayIFoundOut.com. To subscribe to Today I Found Out's "Daily Knowledge" newsletter,click here or like them on Facebook here. You can also check 'em out on YouTube. This post has been republished with permission from TodayIFoundOut.com.